Yesterday I’ve posted an article “BrowserShots.org Removes Opera?” and would like to update you. Johann from BrowsherShots.org explained, that they haven’t removed Opera from the website, it’s just because not all the screenshot making machines (with different operating systems and browsers) working all the time. Today I was taking some screenshots using BrowserShots.org (read more about it here) and noticed that they have added some extra browsers BUT removed Opera 9.21. I wonder if they are just upgrading script or removed for some unknown reasons. Time for one of my favorite topics, it’s a browsers market share. You can find previous month (May) results here. OK, Internet Explorer, it actually surprised me, I didn’t exptected its growth this month. Gained from 78.67% to 78.84% (0.17% increase). In the previous month, Firefox lost some market share, however, this month it’s 0.01% higher. Gained from 14.54% to 14.55% (0.01% increase). Maybe will increase it more in this month, we will see. As expected, Safari lost more than a small amount of market share, maybe will get better after Safari 3 final release. From 4.82% to 4.49% (0.33% decrease). Althought Opera lost 0.02% of its market share last month, it doesn’t matter now, they have increased market share from 0.74% to 0.91% (0.17% increase). And as I can see, it is the highest market share ever in this year. As Safari, Netscape also lost some market share. From 0.83% to 0.78% (0.05% decrease). Opera Mini got nice amount of attention in the June, so not a big surprise, they have increased market share from 0.16% to 0.21% (0.05% increase). Here’s a graph of current browsers market share. Thanks to HitsLink. What? BlackBerry Browser??? That’s right. BlackBerry Browser is currently in development and it’s planned for BlackBerry Pearl 2 or so. There should be some really cool features, well… Actually I know only one now which is really exciting, it’s a tabbed browsing. 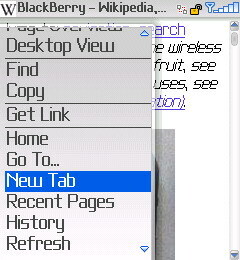 Here are some screenshots of the BlackBerry Browser. Althought it’s currently lacks of interface but looks promising. You may also vote in the ZDNet poll: New BlackBerry browser or Opera Mini? Why Do You Use IE, Firefox, Opera, Safari, Netscape Or Any Other? I am just curious, why do you use Internet Explorer (IE), Firefox, Opera, Safari, Netscape or any other web browser? When you are using one or other browser? Do you use only one or more? Send me an email to questionsATfavbrowser.com or just leave a comment in this web site with your answers. I will post some of them here so we could get main view why one or other browser is being used. If you are developing a web site, you should already know that the more web browsers renders it correctly, better it is for you and your visitors. I would like to suggest a tool/site called BrowserShots.org. If you don’t want to install every web browser in your computer, buy Mac and/or PC this site will help you a lot. I hope this will help you to develope web browsers friendly web pages. Good luck. I’ve checked FavBrowser.com and after removed YouTube video (which cause some problems with Firefox 2.0.0.3 on Linux), seems that it renders correctly in every web browser. Now you can make web browser friendly pages. Good Luck. If you haven’t seen this video yet, be sure to do that. “I apologize. I should have been more specific. Our products will be the first to allow normal, non-loser people to do these things.”Also, according to Apple, Safari 3 for Windows is much faster than Opera or Firefox. Of course, this seemed to be not so true.Well… I think that Opera is no longer a “quiet” browser. They’ve responded with a funny video about Opera Mini and iPhone. They are trying to get as many attention as possible now instead of just spreading word via it’s community. I am glad that they’ve changed the way in which they promote products. I am also almosut sure, that Apple will create something similar to this against Opera too. Maybe that means war. We will see in the future. As for now I am really happy with things they are doing now. They want attention in any price. See Mom, we’re not a small company and we came to beat our competitors. So stop ignoring our browser, as we are here now. Congratulations to all the webware 2007 winners. Internet Explorer gained nice amount of market share this month. From 78.03% to 78.69% (0.66% total) and continues to be world’s most popular web browser. This time Firefox lost some market share. From 15.42% to 14.54% (0.88% total). As Internet Explorer, Safari also gained some market share. From 4.59% to 4.82% (0.23% total). Good news for Netscape as well. This browser managed to gain a peace of market share as well as IE and Safari. From 0.81% to 0.83% (0.02% total). Good news for Opera Mini. With lots of attention going on, this mobile browser increased it’s market share from 0.13% to 0.16% (0.03% total) and continues growing. If you are wondering why I’ve placed “Browser of the Month” in FavBrowser.com (Favorite Browser) page, that’s because I will be reviewing latest stable browsers and pick a winner. When I will start doing that? Since currently there are plenty of reviews about FireFox 2, Opera 9.2, Internet Explorer 7 (IE7) and other ones, I will be waiting till the next month or even more till someone release brand new stable web browser version. That’s why I’ve placed a “?” for the month of the June.